On the radio recently, another self-proclaimed expert predicted confidently that from this day forward, the printing of maps would cease. Instead, from now on we will all find our way using the GPS-linked apps on our cell phones. An alternative future he unconsciously conjured, though, was of society after its technology has collapsed, when those GPS satellites have gone the way of moon landings, or cell phones have succumbed to an intractable virus, and mankind is left helpless among the streets, freeways, airports, and launch pads that were its proudest accomplishments, wandering like someone who has lost his glasses and stumbles from here to nowhere, unable to find anything. Had he thought before he spoke, he might have conjured the world envisioned by Andrew Rice. One of the most resonant images of our time is the empty suit. An ironic expression of many things, not least the feeling we share that our roles may become more real than our selves, the suit can be formal or informal, uniform or unique. But Andrew Rice, one of Salt Lake’s master printers, has settled on a suit that none of us wears, yet which perfectly captures many of the irreconcilable paradoxes of modern life. Given the recent, sudden ubiquity of hazmat-style garb worn by the doctors and nurses struggling to stop Ebola from becoming a global pandemic, Rice could be excused for ripping his imagery from the headlines. 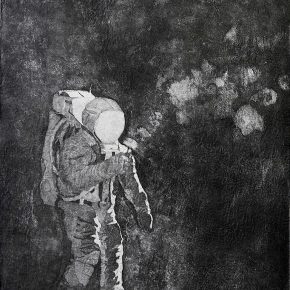 But the fact is it has been a couple of years since his astronaut figure, in a space suit with the paradoxical power to render the wearer at once anonymous, yet unmistakably human, moved from a peripheral ornament in his prints and drawings to become the central image in his ever more atmospheric, more powerful work. 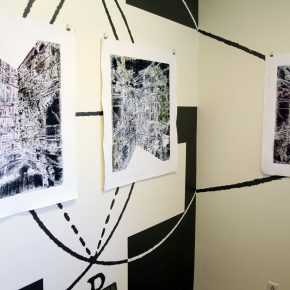 One can only hope that the prescience he showed then is not being repeated in his latest work, currently on display throughout the front room and working spaces of Saltgrass Printmakers. 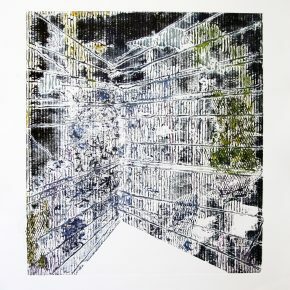 In these collagraphs and large drawings, in which the artist employs his oil stick like a chisel, the astronaut figure has disappeared, leaving us to contemplate the now-empty urban landscape through which he moved. It’s no criticism of Andrew Rice to point out that his concerns are commonplaces among his contemporaries. From the Hunger Games movies and a thousand post-apocalyptic novels to the report of the National Geologic Survey, released as this was being written, that Utah now leads the nation in water consumption, the threat of extinction is on the mind of every person who is paying attention. What Rice does, though, is crunch together seemingly opposite models of thought and behavior. 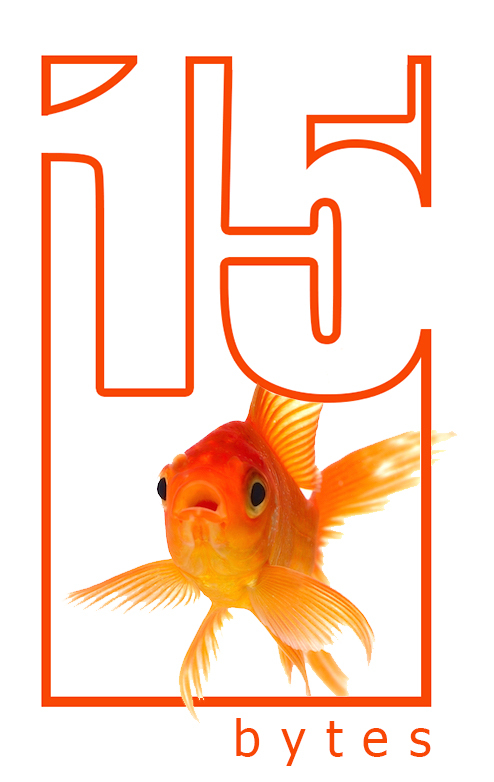 He takes the vaunted human urge to explore, to press on into the unknown, one of our favorite things about ourselves, and turns it around, showing how a device meant to allow us to carry our home environment into alien places increasingly measures the shrinking of that environment. But what his imagery says about our environmental crisis is the narrow view when compared to what it says about how we put ourselves in this predicament in the first place. First, these images invoke our increasing isolation from each other; the ability to shut out unwelcome intrusions of any sort that feed our sense of entitlement to be selfish. What are our individual cars, gated communities, McMansions equipped with closed-circuit entertainments, and presorted news programming, guaranteed to contain nothing we disagree with, but isolating membranes allowing us to focus on the lifestyles of the rich and ‘famous’ as personal goals? Meanwhile, the celebrity politicians who promise to deliver what we want turn away instead and join the wealthy class of oligarchs who actually run our world for their own interests, leaving us with only our increasingly dilapidated life-support suits. But Rice doesn’t stop there. Or it might be more accurate to say he doesn’t start there. The astronaut blundering down the labyrinthine corridors of a poisonous city harks back to Shakespeare, even to the Greeks. The space suit which replaces our skins in the hostile environment of space stands in for the individuality that makes our existential predicament both possible and yet tragic. We can touch each other, even join each other briefly, but the very thing that makes individual life possible renders us permanently alone. In one image from a previous body of work, the astronaut plucks a daisy and attempts to blow the tiny parachutes into the air. Of course the helmet that keeps him alive prevents it. So it is that everything breathing permits us is lost, including a lover’s whisper and a citizen’s speech. 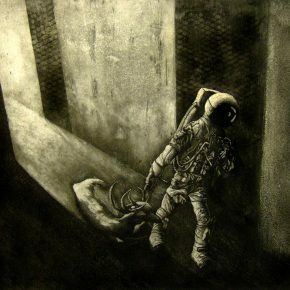 In one of the most disturbing images, a hunter in a spacesuit drags a deer carcass through the corridor, an image that foretells how far more than the ability to find an address by GPS is at stake in an increasingly alien, technological world that omits human senses and abilities. 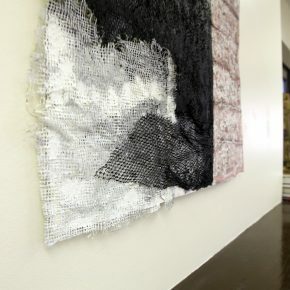 Showing at Saltgrass allows Rice to take commercial as well as artistic risks, while allowing the public a rare opportunity to enter the studio and see the art in the place where it takes physical form. 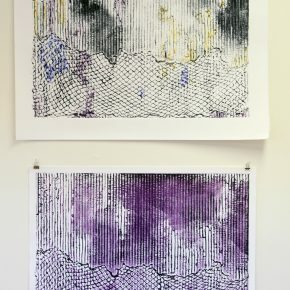 If asked, Rice, a sophisticated print teacher who likes to show his matrices alongside the prints he pulls from them, can be persuaded to demonstrate the variety of printmaking techniques that go into his richly complex collatypes. One of the more popular local artists, in spite of (or because of) his dour subjects and treatments, Rice shows how a raw nerve can turn an artist into a live wire. 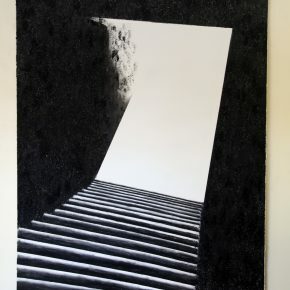 His drawings or paintings—he admits he doesn’t know which to call them, and it doesn’t seem particularly to matter—profit from close viewing of their heavy impastos of dark oil. That said, the big change here is the disappearance of the figure. He calls these recent prints “more abstract,” and it’s true, but only in a way. Though deprived of their dramatic actors, these images permit the eye to conjure space within them, space wherein they recall the confining walls, the corner where a shadow was once cast, and the menacing environments formerly encountered by the astronauts. What’s different is how removing the figures allows him to concentrate on the surfaces that once surrounded them. 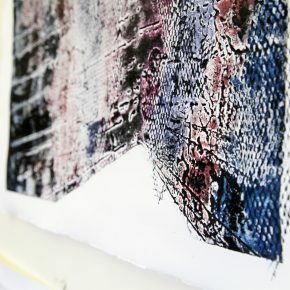 The collatype technique—as in collage, the name implies gluing together—lets the artist layer found materials into suggestive, even familiar textures that become de-familiarized when printed using intaglio and relief inking simultaneously. De-familiarizing renders these textures newly aestheticized, so that with exposure what initially generated negative reactions brings feelings of pleasure instead. 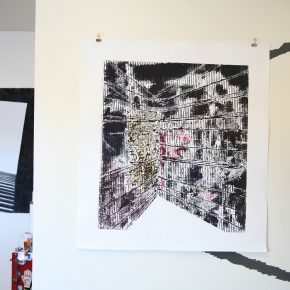 With this greatly more generalized agenda, the works recall the wonderful bas-reliefs of Claire Wilson, fragments drawn from architectural constructions, that she showed at the City Library a year ago. The difference between what we call representation and what we call abstraction is way overdrawn, more important to judges than sinners, and works like these, that make us fall back in love with the abstract nature of reality—or should that be the abstract reality of nature?—cannot be seen too often. 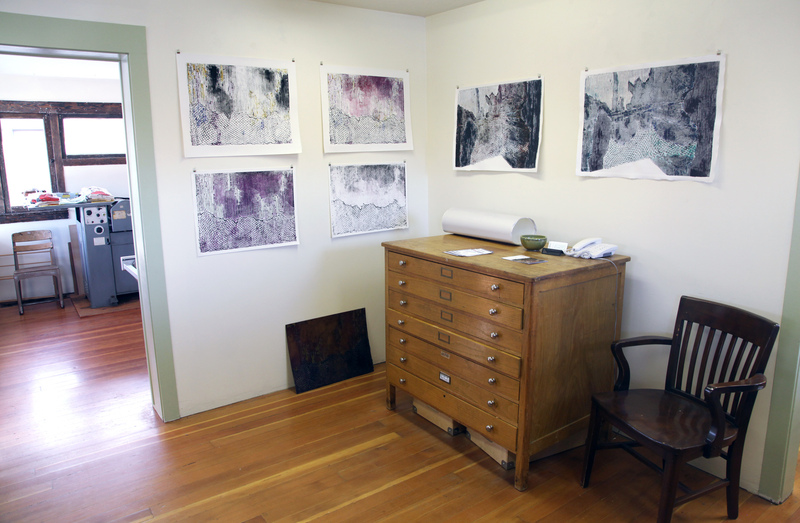 Andrew Rice’s new work will be at Saltgrass Printmakers in Sugar House through December. 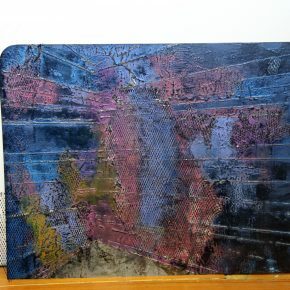 His works can also be seen at New Narratives, the exhibit of University of Utah faculty at the Utah Museum of Fine Arts and at andrewriceart.com. Thanks for the words, Geoff!